With an enviable location in the trendy beachside district of Santa Barbara and backed by the Santa Ynez Mountains, the Bacara Resort And Spa lives up to the luxurious chic of its destination. Breathtaking views, romantic landscaped gardens and stunning wedding venues combine to make this one of the most sought-after beach hotels for couples to say “I do”. Large wedding ceremonies can be held on the dramatic Bacara Bluff, set high above the Pacific Ocean and offering unforgettable views from its expansive lawns. Or opt for the Ocean Lawn, surrounded by the Bacara Resort And Spa’s lush gardens and adjacent to private rooms where you and your bridal party can prepare for your special day. 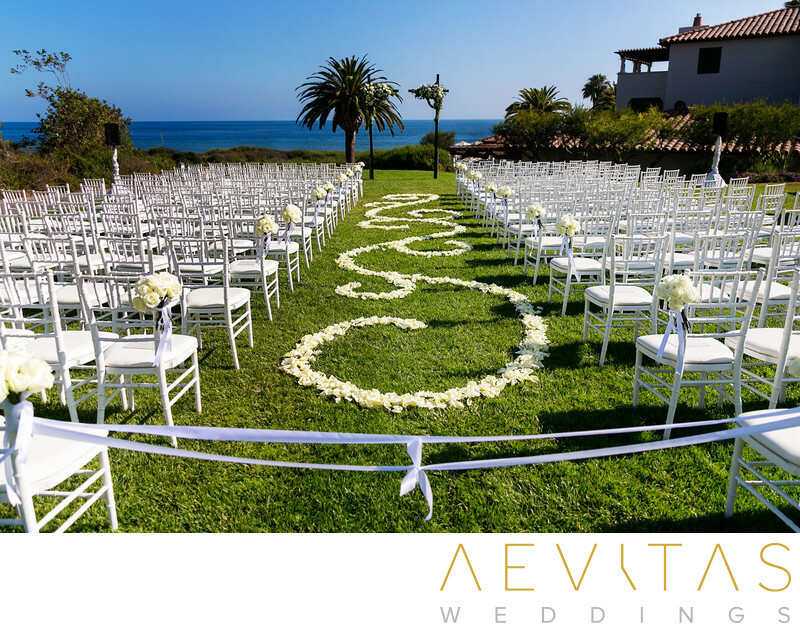 For more intimate wedding ceremonies, you can exchange vows on the Residence Lawn, coupled with the Bacara Resort And Spa’s luxury retreat - The Residence. Wedding packages here can accommodate up to 120 guests and include a two-night stay at this indulgent escape. Or you can walk down the aisle at the spacious Oval Lawn, set within its own private garden and surrounded in seasonal blooming flowers. The Bacara Resort And Spa is spoilt for choice when it comes to gorgeous couple portrait locations, ranging from shaded gardens to glamorous interior features. Wander down to the sands for a sunset portrait session, bathed in the late afternoon sun’s warm glow, and sneak out for a nighttime shoot utilizing the Bacara Resort And Spa’s romantic outdoor lighting. Undoubtedly the Bacara Resort And Spa’s most spectacular reception space is the Bacara Ballroom, covering 11,300 square feet of opulent luxury. 23-foot high sculpted ceilings combine with gilt-framed mirrors and intimate balconies, and there is a newly added vaulted foyer for drinks and hors d’oeuvres during cocktail hour. But if you prefer an alfresco reception event, there is also the Rotunda venue. It sits perched atop Bacara Resort And Spa’s main lobby and features a stunning wrought-iron chandelier and elegant, wood-framed windows. Spectacular ocean views can be had from the Rotunda’s terrace, with the option to wine and dine under the stars before moving inside to the dance floor. For intimate wedding parties of up to 40 people, the Bacara Resort And Spa also has its own rustic wine cellar, with an outstanding selection of 12,000 wines from across the globe on show and an elegant private dining room. The Event Services team will be on hand to assist with all the planning and logistics of your wedding day, from deciding on your menu from their full-service catering packages to adding in your own personalized decor and detailing. There are more than 350 beautifully-appointed rooms and suites for you and your guests to retire to at the end of the night (or spend the entire weekend), with everything that Santa Barbara has to offer right on your doorstep.